So simple in its creation, so magnificent in its maturity, this wonderful ale begins with Nature's most humble offerings, water, malted grains and hops. Our soulful yeast breathes life and depth into each brew. The steady hand of time orchestrates this alchemy into the splendid ale before you. Cheers! This beer pours a dark amber with deep ruby hues and a fairly rich off white head. It also seems to be highly carbonated with lots of tiny bubbles rising up from the bottom of the chalice. This is a very interesting nose for a quad. The sweet malts are more of a caramel malt rather than a roasted malt. This also would explain the light color. The other interesting aspect to the nose is hops, not your normal aroma for a Belgian Style Quad. Plus these hops smell like a typical American cascade hop. Also missing from the nose is that classic yeasty aroma. Well, maybe they are there but it is not those normal Belgian yeast and dark fruit esters of a Quad. The Belgian purist in me is having a hard time so far with this beer. I’m finding everything wrong for the quad. Hopefully the taste can redeem this brew. The taste is not bad, not bad at all. I going to regroup here because I’ve been reviewing this as a Quad based on the BeerAdvocate.com classification. Victory does not call this a quad on its label or website. 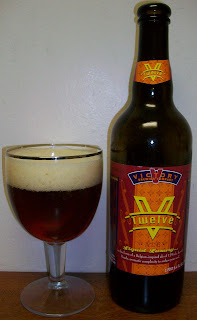 It is a Belgian Inspired…Amber Ale…of 12%ABV. In short; I’m going to lighten up. Sweet caramel almost toasted malts up front followed by a nice effervescence. The back end of the taste is filled with sweet fruity notes and a creamy mouthfeel. The finish is fairly dry with hops and the high alcohol in the beer. Not nearly a quad but this is an excellent strong ale. As this beer warms the alcohol is more pronounced not only on the nose but also in the taste. This beer is now at 67 degrees. It has warmed nicely; it is much smoother. The effervescence is almost gone and it was replaced with a creamier mouthfeel. Well, as it turned out I am very impressed with this beer. The last few sips were at 69 degrees. This is an Excellent Brew. Once I overcame my Belgian Bier Snobiness I really did enjoy this beer. This is an excellent Belgian Inspired American Strong Amber. We just have to wait for someone to create that category. Or did it just happen?